Use your feet to best advantage for your movements: detailed photos of foot positions for belly dancers. In the previous article we covered Basic Stance, both right and wrong; and the Wide Stance foot position used for certain hip moves. We also mentioned becoming more aware of feeling our weight and momentum moving through our feet. Let’s carry on from there. Continuing with “basic positions” every beginning bellydancer should know and use, we have one of our most useful foot positions: one foot flat and one foot with the heel up. Since we previously went over two basic foot positions we’ll can this position number three. I’m not trying to hurt anyone’s feelings, but beginners usually have “dead arms” that hang or flop around unless they’re actually using them. The same is true about their feet. 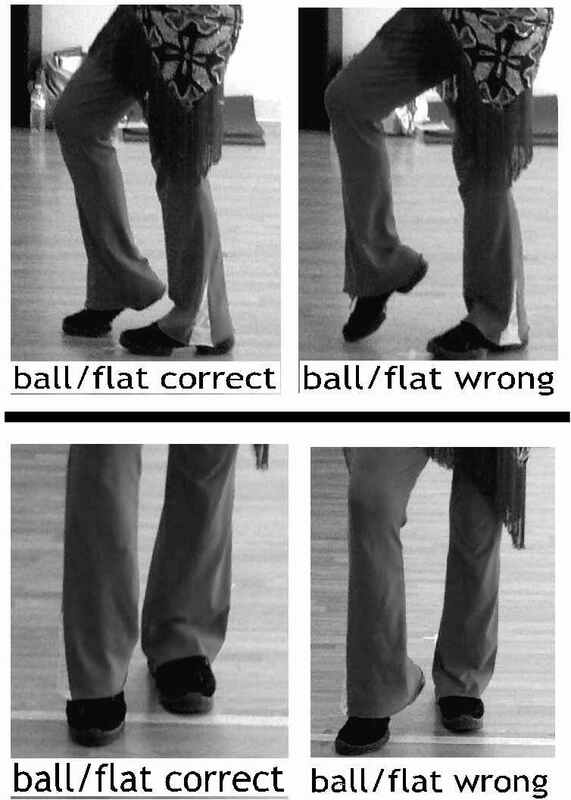 When we perform movements like drops, lifts, or circles with one hip, we usually stand on the opposite foot, and have the other foot (the one underneath the “working hip”) UN-weighted. And here’s the problem: because that foot is un-weighted, beginners don’t realize they still need to think about it! They don’t maintain any energy in that non-weighted foot - just as they let their arms go “dead” when they’re not actually using them. In either case, this is a big mistake! Dancers ALWAYS need to have energy or “life” in their body - ALL parts of it - whether they’re actually moving it or not. “Life” is the beauty of movement; and what’s “dead” should be discarded. So, let’s see what that non-weighted foot under the working hip should be doing. Using only the tip of the toe to touch the floor looks nice in a pose but doesn’t help you do strong hip work. Plus, unless you are actually posing absolutely still, that foot will be jiggling and moving around, which is nothing but distracting. I have to say, this is one of the biggest boo-boos I see regularly; maybe this is that “bad foot technique” I read about! Next time we’ll look at the wide stance and its variations, and see what beautiful moves you can do with those positions!